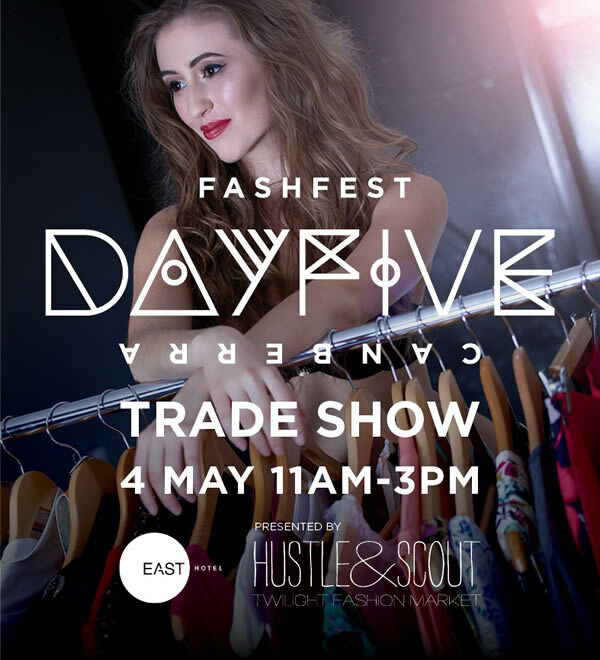 Just when we thought we couldn’t see any more coverage of FASHFEST, they drop the bomb that after their four night show they will be holding a special DAY FIVE tradeshow! This event will give fashion retailers and the public an exclusive opportunity to shop the runway and connect with their favourite FASHFEST designers. Twenty-two local fashion designers will be on hand to sell their designs, talk about the inspiration behind their work and take orders. DAY FIVE is an important day for boosting local business. Even more importantly, says Steve Wright, who teaches fashion design at Canberra Institute of Technology, an event like DAY FIVE provides a real-world wholesale and retail environment for designers, including those who might not otherwise have that experience. DAY FIVE is presented by Tegan McAuley, the founder of the Hustle&Scout Twilight Fashion Market, who has worked closely with the FASHFEST team in pulling together the tradeshow. FASHFEST’s Director of Music, Mr Michael, will present a DJ set featuring retro classics mixed with modern chillers to represent the diversity of design talent showcasing at the DAY FIVE event. East Hotel’s OX Eatery will operate a pop-up bar serving nibbles and drinks, including the exclusive DAY FIVE cocktail of gin and lemon mash topped with sparkling and a maraschino cherry ($10).